In yet another magical moment in a string of magical moments since we began our journey to pass Our City Our Home (OCOH), the revenue measure that doubles the city’s homeless efforts, the city received $415 million in unanticipated revenue. This was two years’ worth of Educational Revenue Augmentation fund or ERAF, which is basically excess property tax that goes to the state and back to us. The Our City Our Home Coalition is recommending that $171.4 million of that go to properly begin implementing November 2018’s Prop C “Our City Our Home,” which passed with over 60% approval, but is held up in court. 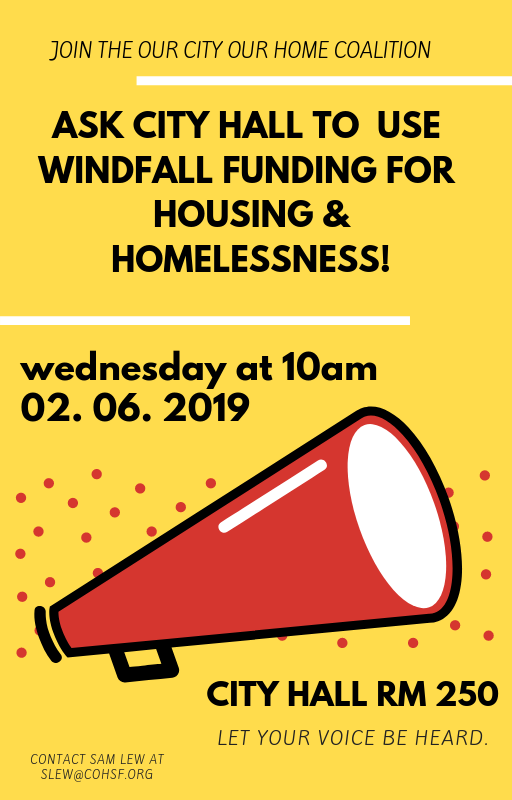 This windfall is poised to fund numerous “shovel ready” projects and begin tackling the homelessness crisis this year. $171.4 million provides 875 homeless housing units, 340 shelter beds, behavioral health services for 397 individuals, and homeless prevention services for 3,100 households. In line with Prop C, the OCOH Coalition is calling for 20% of housing to go to youth and 25% to go to families, through both 100% homeless housing and set-aside units in affordable housing buildings. San Francisco and its residents suffering on our streets cannot afford to wait until the lawsuit is settled. The Proposals: There are two proposals before the Board of Supervisors – one from Mayor and the other from Supervisor Peskin. Both have matching funding for homelessness, except Peskin’s does not have funding for bathrooms, and his homeless proposals are for two years funding while Mayor Breeds are for four years. However, neither of the proposals fund solutions for homeless families or youth, nor do they have funding for community mental health or prevention of homelessness. The proposals are also leaving money on the table. Neither fully take advantage of funding sources listed above – Supervisor Peskin’s proposal is about $10 million more then Mayor Breed’s, but still leaves $40 million in new rainy day funds on the table. The Peskin Proposal also has funding for childcare, teachers and PG&E power plant acquisition, while the Mayor’s does not. We have been resisting being pitted against these other needs – calling for prioritization of homeless funding and asking the city to “grow the pot” to meet other needs.